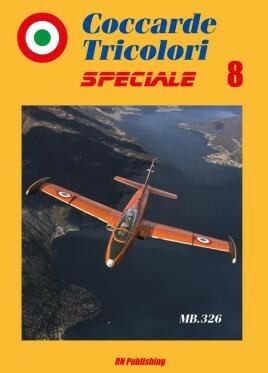 This latest title of the "Coccarde Tricolori Speciale” series is dedicated to a famous trainer and light attack aircraft, which flew for many years in the Italian colours, but also with several international air arms. The book, which collect also unpublished photos, and information, is divided into several chapters, dedicated to the detailed description of the programme, including the single-seater, to the operational service in Italy, to a large photoalbum, to chapters dedicated to the licenced productions, to all the international air forces and civil operators. In the end, a modelling section, with information and various colour profiles, plus a four view, and photographic details of the real aircraft. In the appendix, the list of all the MB.326 produced. A must not to be missed for all the enthusiasts of the fabulous "Macchino”!